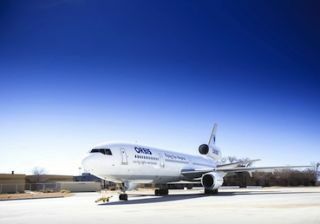 Crestron and ORBIS International, a nonprofit humanitarian organization that works in developing countries to save sight worldwide, have teamed up to outfit the next-generation Flying Eye Hospital (FEH), a MD-10 aircraft donated to ORBIS by FedEx, with Crestron's state-of-the-art technology. The next-generation FEH will include an operating theater, laser treatment room, communications center, recovery room, audiovisual/IT room and a 46-seat classroom, all of which will rely on the Crestron's technology to achieve ORBIS's mission. As an ORBIS partner, Crestron will play an instrumental role in delivering eye care training to thousands of eye care professionals across the world. In addition to providing healthcare solutions, Crestron provides integrated solutions for corporate, education, residential, and government applications. The FEH will utilize Crestron audio/video technology to teach, collaborate and disseminate information. Doctors, nurses and other eye care professionals will gather for lectures, discussions and live broadcasts of surgical procedures performed onboard the FEH. The teaching facility with wings features 15 cameras and 17 monitors. The IT/AV technician can broadcast from any camera to any monitor using Crestron. Several Crestron 24-inch HD touch screen displays will provide control and 2-way communication between the operating theater and the classroom. Crestron speakers will provide the audio for the training sessions, and Crestron DigitalMedia will handle the toggling between cameras to allow eye healthcare professionals to view the procedures in HD onboard. Tablet-style Crestron TSW touch screens will also allow for full control of the audio/video systems. Crestron CEO and aviation enthusiast, George Feldstein took a special interest in this project. His deep involvement in philanthropy and love of flying was a natural fit for becoming involved with the work of ORBIS International and other global organizations, the company says. Feldstein founded the Crestron Eagles Program, a program that donates state-of-the-art home theater systems to military hospitals to provide comfort and entertainment to wounded service men and women returning from active duty in Iraq and Afghanistan.